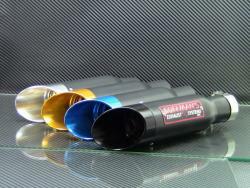 Customize your sportbike with Coffman’s shorty exhaust “tips”. These are the latest buzz in the sportbike exhaust industry. They’re manufactured from the highest quality stainless steel and then powdercoated with a satin black finish. The difference between these and the others on the market is that they have a customized anodized aluminum billet tip! Colors come in black, gold, blue and polished aluminum. They are on the leading edge of technology with a manufacturer that has been proud to serve the marketplace 40 years! Want to change colors down the road? The tip can be removed and replaced with another color of your choice! Billet Tip: customized anodized aluminum billet tip available in black, gold, blue and polished aluminum (not anodized). Stainless Steel: manufactured from the highest quality stainless steel and then powdercoated with a satin black finish. High Tech: designed and manufactured with leading edge technology to produce the best quality product possible.